Chrono is owned and copyrighted by Project Chrono, a non-profit organization set up in the US. The entire Chrono software infrastructure is open source and released under a BSD-3 license. As such, one can use, modify, redistribute, sell, etc., the software. Does Chrono have a graphical user interface? No, it doesn’t. However, if you need a CAD-like interface, consider the use of the Chrono::SolidWorks plug-in. It supports a work flow in which you can develop an assembly in SolidWorks© and then export it as a model that can be subsequently imported and simulated in Chrono. Another alternative is the use of a third party commercial tool that embeds Chrono and which provides a GUI. Another solution, under development by a third party, is https://www.isymtec.ai . What sort of problems is Chrono positioned to solve? Chrono is a simulation tool that can be used to understand how physical systems change their state in time. This is a broad description, but this is where Chrono is heading. Today, Chrono provides really good support if your physical system is a mechanical system such as a vehicle, robot, suspension system, etc. It provides good support if you are interested in the motion of compliant systems, such as collections of beams, shells, etc. This support comes via Chrono::FEA. Finally, there is fledgling support for fluid-solid interaction and fluid dynamics, which comes via Chrono::FSI. What applications has Chrono been used for? Robotics, vehicle dynamics (wheeled and tracked), terramechanics, granular dynamics, mechanism design, farming, food processing, building collapse, connected autonomous vehicles. Why shouldn’t I use Bullet©, or ODE©, or Physx©? They too look at how systems change in time and for some problems they do it many times faster than Chrono. Chrono takes a physics-based approach to the modeling and simulation of complex dynamic systems. As such, we are paying a price for trying to stay faithful to the underlying physics governing the time evolution of the system of interest. We are committing a significant chunk of our effort to validate the modeling and simulation techniques we rely upon in Chrono. Many of these validation activities are reported in several technical reports and theses. I want to use Chrono. Do I have to be a good programmer? No. You only need to be able to install the software and go through a couple of examples/tutorials to get the gist of it. Moreover, if you need a jump start to your project you might want to take a look at the Chrono model repository. If you are lucky, you’ll find a model close to what you need, in which case you’ll get a jump start to your project. Finally, there is also a consulting avenue. If you feel like Chrono is the best thing since slice bread and you want to support its development, make a tax deductible donation to the University of Wisconsin-Madison or University of Parma, Italy. Let us know if you follow this path since we want to channel your financial contribution into our labs to fund the development of Chrono. Can Chrono be compiled on platform X with compiler Y? Currently we build Chrono under Windows© (32 and 64 bit with the MingW GNU© compiler, Microsoft VisualC++©, and Intel© compilers) and Linux© (32 and 64 bit, GNU and Intel© compilers). Chrono is designed with Chrono::Engine at its core. Beyond that, it has several modules that augment core Chrono::Engine functionality. For instance, Chrono::Parallel adds support for parallel computing when handling large systems; Chrono::FEA enables the analysis of systems with flexible bodies; Chrono::FSI provides support for fluid-solid interaction simulations, etc. In general, we use “::” to denote a component of Chrono that under the hood; i.e., at a level that is not immediately visible to the user, provides the software implementation needed to support a class of services associated with an important feature of Chrono. We use these module names in a rather lax way since to identify parts of the code. In practice, it is actually hard to pinpoint where Chrono::Engine ends and Chrono::FEA starts. What is the difference between Chrono::Engine and Chrono::Parallel? Chrono::Engine is the core of the Chrono middleware. Chrono::Engine was designed to primarily support rigid multibody dynamics, and in doing so to support as broad a spectrum of problems as possible. Chrono::Parallel is a module that solves fast a subset of problems that Chrono::Engine can solve. In other words, it trades generality for speed. What is the difference between Chrono units and Chrono modules? There is no difference, we use these two terms interchangeably. We recognize a module/unit by referring to it via the “::” notation. What is a Chrono toolkit, and how is it identified? A toolkit represents a collection of services provided at the API level to allow the user to set up Chrono simulations quickly. The toolkits are focused in their purpose. For instance, there is a toolkit called Chrono::Vehicle to facilitate the modeling and simulation of vehicles in Chrono. What is a typical Chrono work flow? 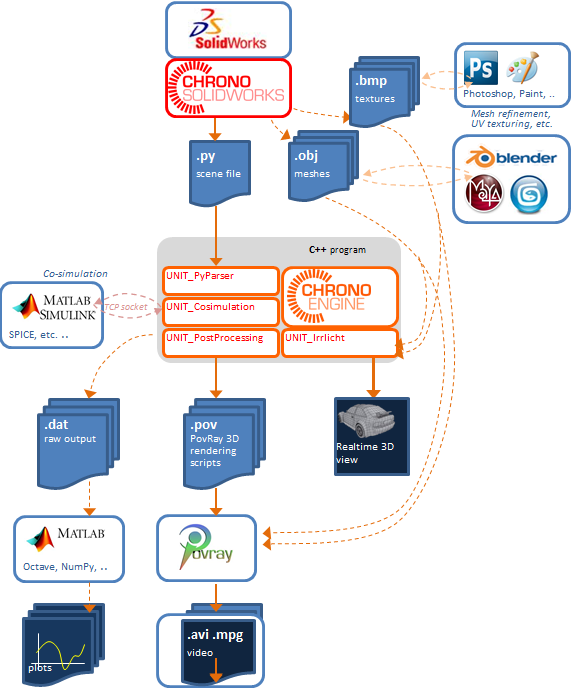 The Chrono infrastructure is a modular set of libraries for multi-physics modeling and simulation. Some of these modules allow interfacing Chrono to external software, e.g., for pre-processing and post-processing data, displaying real-time simulations with OpenGL, or parsing Python commands. The power of Chrono stems from its open source attribute, which allows the user to mix-and-match modules to establish a work flow that matches his/her needs. The image below outlines one possible work flow in Chrono: a model is defined in SolidWorks© and enhanced with textures from some graphics package. The analysis might require a co-simulation with MATLAB©. The results can be post-processed with Pov-Ray© to obtained high quality movies. What is a high level overview on how Chrono is organized? One can think of Chrono as having five foundational components that provide support for equation formulation, equation solution, proximity computation, parallel computing, and post-processing. The software is organized so that it draws on parallel computing: GPU computing (as enabled by CUDA), multi-core parallel computing (as enabled by OpenMP), and distributed-memory parallel computing (as enabled by MPI). The rigid body dynamics, flexible body dynamics, and fluid-solid interaction solution is built on the aforementioned foundational components. An API is in place to define a model and instruct Chrono to perform certain operations in relation to it. User toolkits (such as Chrono::Vehicle, Chrono::Granular, etc.) are in place to ease the pre/post-processing burden associated with Chrono simulation. Some modules are less developed than others. For instance, the MPI support is not available at this time owing to poor scaling performance we obtained during previous experiments. How do I cite Chrono? Project Chrono. Chrono: An Open Source Framework for the Physics-Based Simulation of Dynamic Systems. http://projectchrono.org. Accessed: 2016-03-07. Project Chrono. Chrono: An Open Source Framework for the Physics-Based Simulation of Dynamic Systems. https://github.com/projectchrono/chrono. Accessed: 2017-05-07. A. Tasora, R. Serban, H. Mazhar, A. Pazouki, D. Melanz, J. Fleischmann, M. Taylor, H. Sugiyama, and D. Negrut. Chrono: An open source multi-physics dynamics engine. In T. Kozubek, editor, High Performance Computing in Science and Engineering – Lecture Notes in Computer Science, pages 19–49. Springer, 2016.